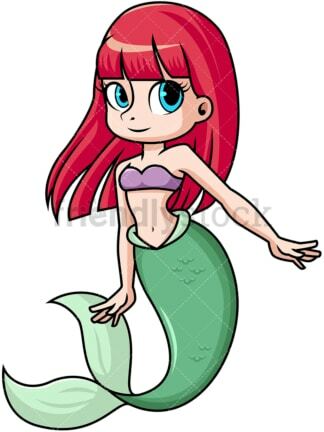 Royalty-free stock illustration of an adorable mythical creature – half woman and half fish – with red hair, big blue eyes and a scaly green tail, wearing a bikini, smiling and looking happy. Royalty-free stock illustration of an adorable mythical creature – half woman and half fish – with purple hair, big green eyes and a scaly light-red tail, wearing a bikini, looking sad and irritated. 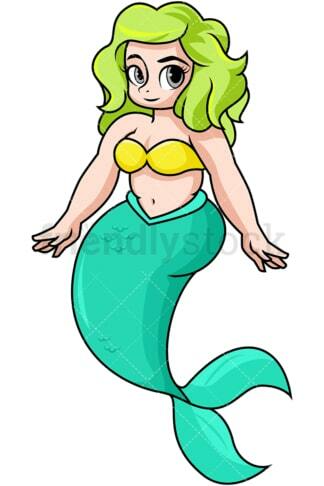 Royalty-free stock illustration of a cute mythical creature – half woman and half fish – with rich blue hair, big green eyes and a scaly tail, wearing a bikini and crossing her arms over her chest, looking irritated. Royalty-free stock illustration of a cute mythical creature – half woman, half fish – with curly black hair, big eyes and a scaly purple tail, smiling and looking happy and excited. Royalty-free stock illustration of a slightly overweight mythical creature – half woman and half fish – with light-green hair, big grey eyes and a scaly petrol tail, smiling and in a good mood. 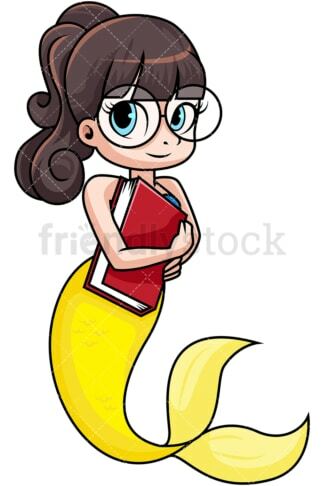 Royalty-free stock illustration of a geeky mythical creature – half woman and half fish – wearing glasses, with brown hair, big blue eyes and a scaly yellow tail, smiling and looking happy while holding a book in her arms. 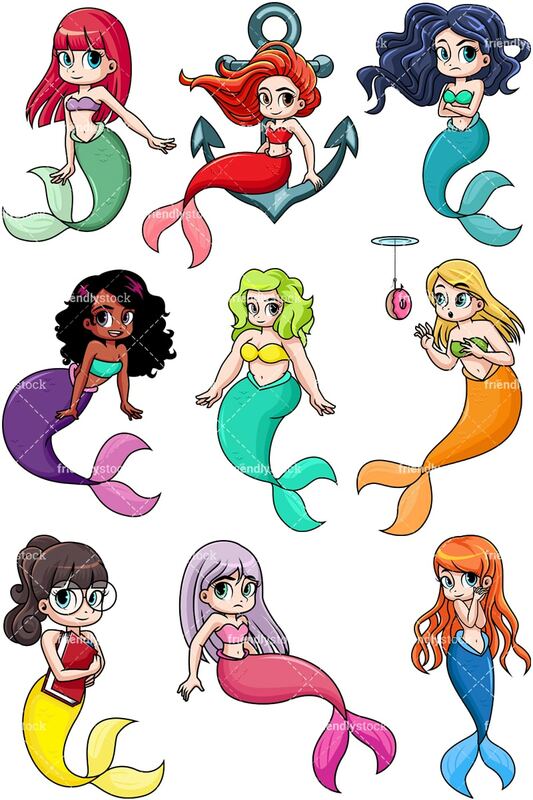 Royalty-free stock illustration of a cute mythical creature – half woman and half fish – with blonde hair and an orange scaly tail, being attracted by a donut on a fish hook while underwater. Royalty-free stock illustration of a cute mythical creature – half woman and half fish – with ginger hair, big blue eyes, and a scaly blue tail, smiling and looking in love. 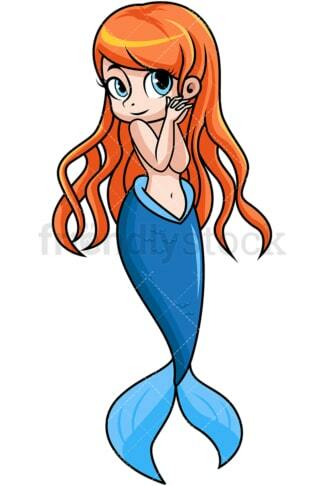 Royalty-free stock illustration of a cute mythical creature – half woman and half fish – with red hair, big brown eyes, and a scaly red tail, smiling while sitting on a big anchor thrown by a ship.